Bray Creek campground was empty except for Mike and Denny. They were gone but we recognized Mike’s pop up camper. Feral and I pulled in late afternoon with our tents and set up. This was a couple years ago. 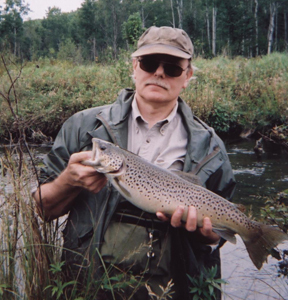 Bray Creek campground is on the Baldwin River in Lake County, Michigan. At the upper end of the campground Bray Creek feeds into the Baldwin making a pool that is slightly warmer than the rest of the river, and almost deep enough for a swim. As kids camping with our grandpa, we fished Bray Creek for chubs as the water was too warm for trout. I caught my first trout on the Baldwin. Feral and I brought guitars, including my Les Paul Studio electric and my battery powered Fender Amp Can which looks like a coffee can on steroids. I also brought my zoom pedal which provides a variety of guitar voices including some pretty ragged distortion that sustains till Monday. Feral brought a jumbo bodied acoustic of unknown brand that sounded sweet with plenty of volume and low end. 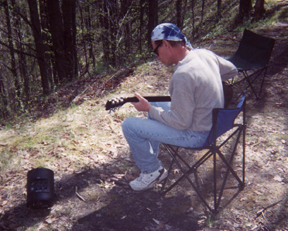 Mike and Denny showed up toward evening and we still had the campground to ourselves so we pulled out the guitars. Feral and I have been playing together a long time so we dug into some of our old stuff, and, as happens most times we get together, I handed him the electric. Since Denny was there, maybe Neil Young’s most devoted fan, we decided to try “Down by the River,” a classic mostly in E minor though I’m no student of music theory. It’s one of those songs that you can do a short version or you can do the long version with a lot of “out there” lead guitar. Feral was up for the challenge. We started out slow with Denny and I trying to reach those high vocals that Neil Young can manage with ease but in my case leaves me hoarse for the next few days. Feral soared on the guitar going places I didn’t know he could go – triple picking leads in a wall of distortion at decibels that would have stopped cars on Highway 10. We did some of our other standards too but Down by the River was the standout. I know we’ll never do a better job on that song. We knocked down a few beers that night and slept well. I suspect we fished the Baldwin the next day but for some reason the only thing I remember is the guitar jam and Feral treading new ground on a song played to death by bar bands in the seventies. Feral’s also pretty good on a trout stream. Maybe it helps he’s a musician.